Since 1983, Lake Champlain Chocolates have made a household name for themselves. Today, the Lake Champlain Chocolate of the Month Club allows people from around the U.S. try and taste these high-quality, handcrafted chocolates. 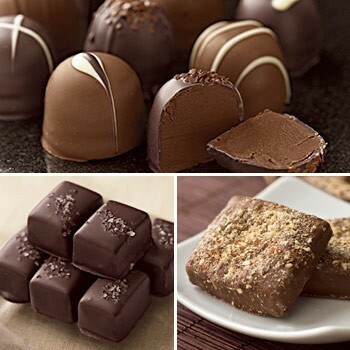 This monthly club gives members plenty of options and always includes gourmet chocolates. A monthly club specializing in gourmet, fine chocolates and treats. The chocolates offered by Lake Champlain Chocolate of the Month Club are limited to what is made by the company, but there is a vast selection of types of chocolate. They not only include milk, dark and white chocolates, but they incorporate Vermont flavors, such as maple, honey, etc. Each shipment comes with something different, so members will not feel as though they are repeating themselves. Just some of the choices members can expect include peanut butter chocolates, dark sea salt caramels, Chocolates of Vermont collection, nut clusters, truffles and bars. All of Lake Champlain Chocolate of the Month Club creations are made from chocolates generated in West Africa, Dominican Republic, and even Peru. They feature Belgian chocolates and some are even made from Kosher varieties. They use only the highest-quality ingredients and try to remain loyal to their Vermont roots by using Vermont flavor favorites. Because these chocolates are not filled with preservatives, they do not last as long as store-bought chocolates, but some still last for up to 20 months – if they even make it that long in a person's house. They do not have much for exotic ingredients or anything extremely unique aside from their Vermont flavors. There are two core memberships with Lake Champlain Chocolate of the Month Club: Chocolate Lovers and Chocolate Fanatics. From there, members can select if they want a three, six or nine month contract with Lake Champlain. Each membership lists what chocolates will arrive and when in the rotation – so members can easily preview what they would be receiving. Prices range from $100 to as much as $485 – depending on the club and duration of that club. Unfortunately, shipping is not included. There are not many perks offered with the Lake Champlain Chocolate of the Month Club. Instead, this club focuses more on their chocolates and the monthly shipments. Members can purchase chocolate outside of the membership, but there are no discounts offered. There are recipes and chocolate pairings as well as a chocolate education guide online too. Lake Champlain Chocolate of the Month Club is one of the few clubs that do not ship in the summer. All memberships will be halted from May to September 15th except on Monday to Thursday. They do take extra precautions to protect the chocolate, but they do not mention what they will do to prevent chocolates from melting during the summer months. Shipping is in addition to the membership price, which means members will pay $16.95 to $29.95 per shipment. All of their chocolates are packaged in very attractive boxes and/or baskets for presentation. All of the memberships offered by Lake Champlain Chocolate of the Month Club are designed to be given to someone else or the member. When purchasing as a gift, Lake Champlain will include a welcome message with the first shipment. There are no special gift add-ons offered for those that are purchasing this as a gift though. There is plenty of information available on the website, including chocolate education and FAQs, but not all of it pertains directly to the membership options themselves. The login portal only allows members to manage their account and payment and there are no special perks within the account that cannot be accessed outside of a login. There are plenty of ways for members to get a hold of customer service – phone, email, mail and fax. But, they are limited to the hours of Monday through Friday from 8:30am to 5pm. There is no live chocolate concierge available with Lake Champlain either. Chocolate Lovers 3 Month: Offers three different offerings, one shipment per month for three months. Starts at $155.00 total. Chocolate Lovers 6 Month: Offers six different types of chocolate selections, one shipment per month for six months. Starts at $265.00 total. Chocolate Lovers 9 Month: Offers nine varieties of chocolate, one shipment per month for nine months. Starts at $485.00 total. Chocolate Fanatics 3 Month: Includes three shipments, one per month. Starts at $100 total. Chocolate Fanatics 6 Month: Includes six shipments, one per month. Starts at $200 total. Chocolate Fanatics 9 Month: Includes nine shipments, one per month. Starts at $300 total. The Lake Champlain Chocolate of the Month Club is ideal for just about anyone – whether you are purchasing for yourself or a friend. They have favorable pricing and excellent chocolates. Because they do use a lot of Vermont-inspired ingredients, you may want to consider your tastes or that of your recipient when it comes to those flavors – such as maple. Also, members will have to be willing to commit to the three, six or nine month periods and cancelling in between may take time to refund. Overall, it is a great club for those that want to treat themselves or someone else. We like the variety that comes with the shipments in the Lake Champlain Chocolate of the Month Club. They have some unique flavors and most importantly, they use fine ingredients. We also like that they use Vermont as their inspiration when creating some of their unique chocolates. One thing we do not like is that Lake Champlain does not offer free shipping and their shipping prices are some of the higher ones we have seen when comparing them to other clubs – which may be a turn off. While all of the chocolates are limited to Lake Champlain brands, these are still very unique and members will get so much variety they will not mind that it is just one brand. A fun chocolate club ideal for all. Lake Champlain Chocolate of the Month Club offers some seriously tempting membership options that span anywhere from three to nine months. They're perfect as gifts or just to treat yourself.